The bichon frise is a small, sturdy dog with a vibrant, jolly personality. Due to its fluffy and curly white hair, this breed is said to resemble a cotton ball or powder puff. Many call it a "living stuffed animal." The bichon is an energetic, people-oriented dog, so it is ideal for active households who want a small companion dog to share adventures with. The playful and affectionate demeanor of this breed makes it an excellent choice for families with children. The bichon is a snuggler. It's no surprise that this is one of the most popular small dog breeds. The breed is loving and joyful, making it a wonderful companion for almost everyone. The bichon frise originated in the Mediterranean where it descended from the water spaniel and the standard poodle. It is a relative of the Maltese, Coton de Tulear, and Havanese. Bichons once traveled with Spanish sailors, were used in trade, and later brought to Teneriffe, one of the Canary Islands. In the 1300s, the bichon was discovered by Italian sailors and became the dog of Italian nobles. Eventually, the breed gained immense popularity throughout France. It is here where its name likely evolved. Frise means "curly" in French and bichon is believed to be a diminutive of biche (female dog). You can see bichon frises in portraits of Spanish nobility painted by Francisco de Goya in the 18th and 19th century. But their popularity waned and they were often seen as street dogs in Europe and performed with organ grinders and circuses. The bichon came to the U.S. in the middle of the 20th century and became an American Kennel Club (AKC) registered breed in 1972. The soft, curly coat of the bichon grows continuously. Because of this coat type, routine grooming is an absolute necessity or it will become matted and tangled. Bichons should be brushed two to three times per week and haircuts may be necessary every several weeks. They also need to be bathed frequently, as white dogs will show the dirt. They are prone to developing tear stains around the eyes. Keep the hair around the eyes trimmed. Nails should be trimmed regularly to keep the feet healthy and comfortable. Maintain good oral hygiene to prevent periodontal disease by brushing your dog's teeth regularly. The bichon frise is one of many hypoallergenic dog breeds. Their curly hair helps keep dander from escaping into the air where it may trigger allergic reactions in sensitive people. This does not mean the dog won't provoke an allergic reaction, but this breed may be suitable for those who are mildly or moderately allergic to dogs. Be sure to spend time with a bichon frise before adopting one to see if your allergies are triggered. 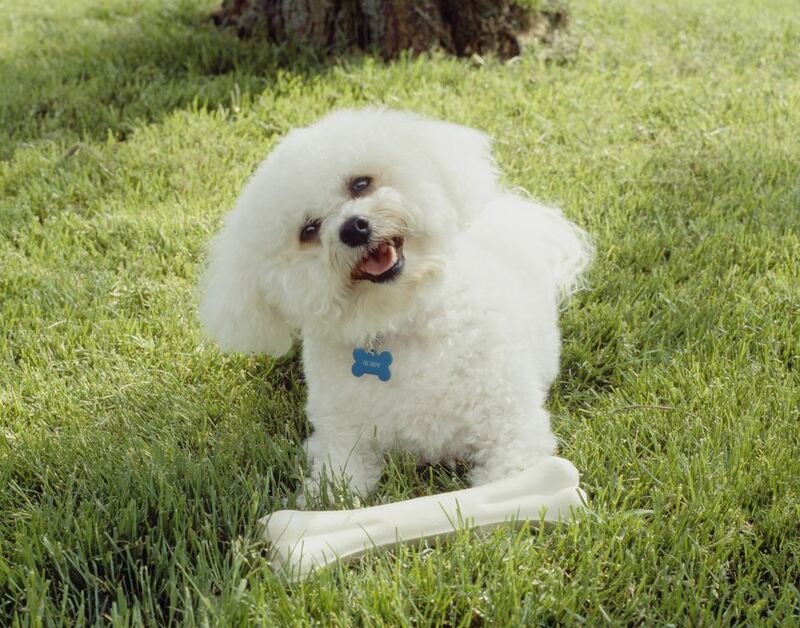 The bichon needs proper training and socialization in order to be happy and well-adjusted. Don't make the mistake of skipping these just because the bichon is a small dog. This breed tends to learn quickly though some feel that housebreaking may take some extra effort. As an active little dog, the bichon should get daily exercise. Daily walks and fun activities like games are important to keep your bichon mentally and physically stimulated. The bichon blitz is a well-known phenomenon when your dog will suddenly dash around the house a minute or two, then settle down. Bichons enjoy playing with other dogs and they can get along well with cats and other pets. They do well with children who are old enough to understand not to handle a small dog roughly. As a small dog, the bichon frise can be injured by rough play. If you must be away from home for long periods on most days, a bichon may develop separation anxiety and develop destructive habits. Having another dog to play with may help. Crate training can also help curb destructive behavior when you are away from home. This breed is usually not a problem barker, but your dog is likely to alert you to visitors. Proper training and socialization can help a dog not be overly cautious and learn to just back once as a signal. Feed your bichon frise two meals a day of 1/4 to 3/4 cup dry dog food. The amount will depend on the dog's size, activity level, age, and other factors. Resist the urge to feed your dog human food as treats. This breed is prone to kidney and bladder stones and may need a special diet and more water to help prevent them. Obesity can shorten a dog's lifespan, and even one extra pound is significant for a small dog. Be sure to monitor your dog's weight and discuss appropriate nutritional interventions with your veterinarian. If you want a little dog that is cute, happy, and fun, the bichon frise could be a great choice for you. As with any breed, if you think this is the dog for you, be sure to do more research before adopting one. Talk to other bichon frise owners, reputable breeders and rescue groups to learn more. What Are Havanese Dogs Like?